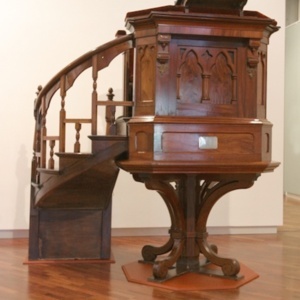 This wooden pulpit was removed from the former Christ Church Congregational Church in Launceston, Tasmania, in 2002 (having originally been in another church building) and is now on display in the Queen Victoria Museum and Art Gallery in Launceston. The pulpit was made by Alexander Kidd, a foundational member of the new Congregational Church established in Launceston by John West (1809-1873) in 1839. West had emigrated from England as a missionary preacher the previous year. The pulpit’s pedestal and octagonal shape were added by Alexander Kidd (Jnr) in 1906. The pulpit is in the Gothic Revival style with the carved pointed arches and columns reminiscent of the architectural features of Gothic churches built in Europe between the twelfth and sixteenth centuries. 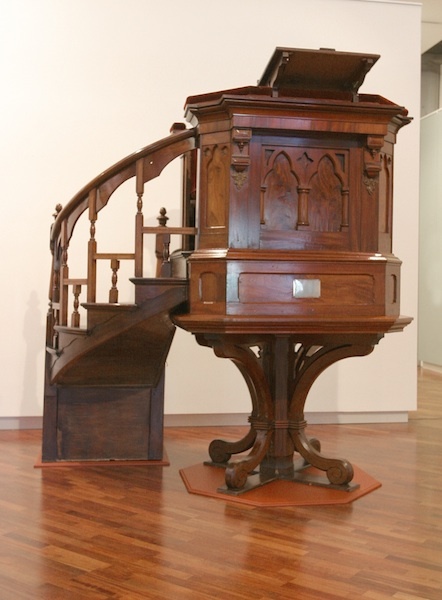 “Pulpit from Christ Church Congregational Church, Launceston, Tasmania ,” Medievalism in Australian Cultural Memory, accessed April 25, 2019, http://ausmed.arts.uwa.edu.au/items/show/1298.